On November 28, Thanksgiving Day, the Aiken Hounds will meet at Memorial Gate in the Hitchcock Woods at 11 a.m. for the blessing of the hounds and the opening meet. This will be the centennial celebration of the hunt, which was established in 1914. 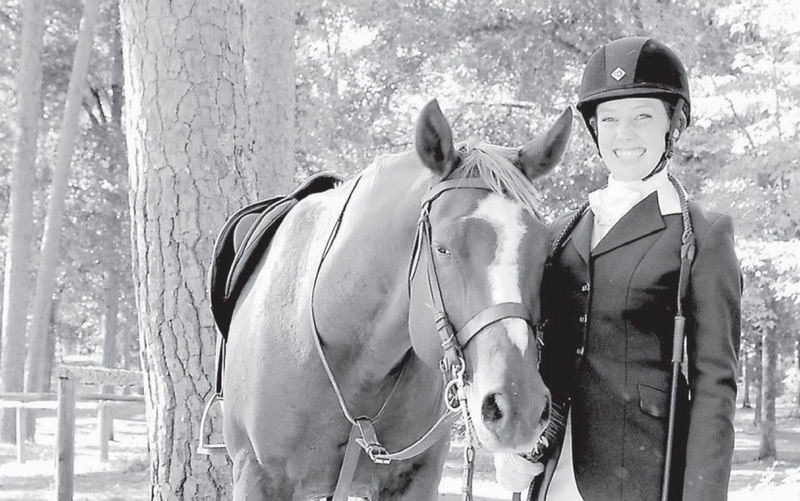 Opening meet is a Thanksgiving tradition in Aiken, attended by hundreds of spectators who park outside the woods and then walk down the trail to Memorial Gate. Horses arrive in trailers that are parked wherever they can find space, and then the riders, in their formal hunt attire, make their way into the woods. The gathering is a celebration of one of Aiken's most venerable institutions, and the informal start of the Aiken winter season. Because this is the centennial year of the hunt, the opening meet will come with a little more fanfare than usual. Organizers are preparing a centennial hunt commemorative program, which will include stories about the hunt as well as remembrances about various people who were important in the hunt's history, and stories about hunting in Aiken. There are a number of items that will be for sale, including two different limited edition silk scarves, one a square with a special centennial year logo, and the other an oblong with a painting by Georgianna Conger Wolcott. There will also be a silk tie in Aiken Hounds colors with the centennial logo, as well as St. Hubert's medals. (St. Hubert is the patron saint of hunters.) These items will also be available at Memorial Gate, and also at the annual "Bloodies and Bagels" breakfast held at the Aiken County Historical Museum on the morning of the meet. The breakfast is for the benefit of the Aiken Land Conservancy. A few other centennial-themed items will be available in the new year, including polo shirts and baseball caps. 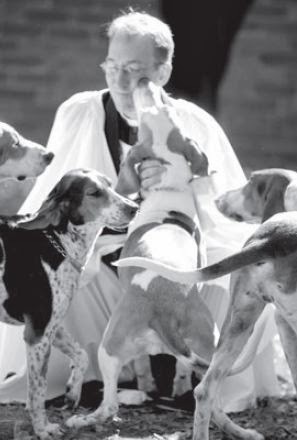 The opening meet includes a blessing of the hounds that will be performed by Father Wiseman from Saint Thaddeus Episcopal Church. Father Wiseman is a dedicated animal lover, and Linda Knox McLean, who is the master of the Aiken Hounds, says that he will by "more hands-on" this year. Linda will also address the crowd, and she will award colors to the foxhunters who have earned them. "Colors" are coat collars of a contrasting color that are sewn to the hunt coats of the most accomplished and dedicated foxhunters in the hunt. The Aiken Hounds coats are green (they were originally made of billiard cloth) while the collars are a pale yellow. According to the book, Life and Sport in Aiken and Those Who Made It by Harry Worcester Smith (Derrydale Press, New York, 1935.) the first hunts held in Aiken were live hunts undertaken by Mr. and Mrs. Thomas Hitchcock with their pack of foxhounds. These hunts never really caught on, however, because "in pursuit of the wild fox precipices were descended by Mr. and Mrs. Hitchcock in a manner that would make the Italian cavalry purple with envy...in those days the fields following the Master and his wife were very small indeed, for leaping precipices wasn't in everyone's veins." The hunt was revived as a drag hunt in 1914, and in 1916, the Aiken Hounds was officially recognized by the Master of Foxhounds Association. Drag hunts do not pursue any live quarry. Instead, they follow a scent trail laid down the morning of the hunt. This gives the baster and the staff the ability to choose the route, and it also ensures that every hunt can be fast and exciting - after all there will never be a time that the hounds are unable to find a scent. Drag hunting came into existence in the early 19th century. 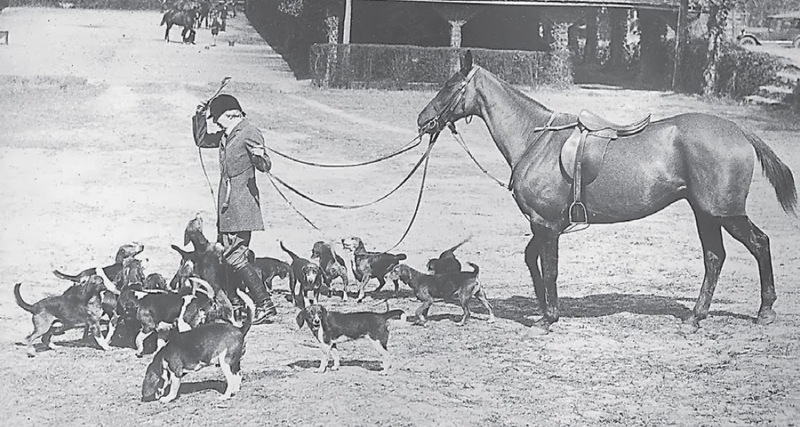 The first drag pack in Aiken was brought down from Pennsylvania by Earle W. Hopping, an international polo player and foxhunting enthusiast from Bryn Mawr. Hopping served as the first master of the Aiken Hounds. He was succeeded in 1917 by Walter M. Phelps, whose family owned Rose Hill Estate in Aiken. In 1919, Mrs. Hitchcock took over the mastership, serving until 1934, the year that she died as a result of a hunting accident. Mrs. Hitchcock with her beagle pack. By all accounts, the years when Mrs. Hitchcock ('Lulie' to her friends) was master, the hunt was a unique experience. 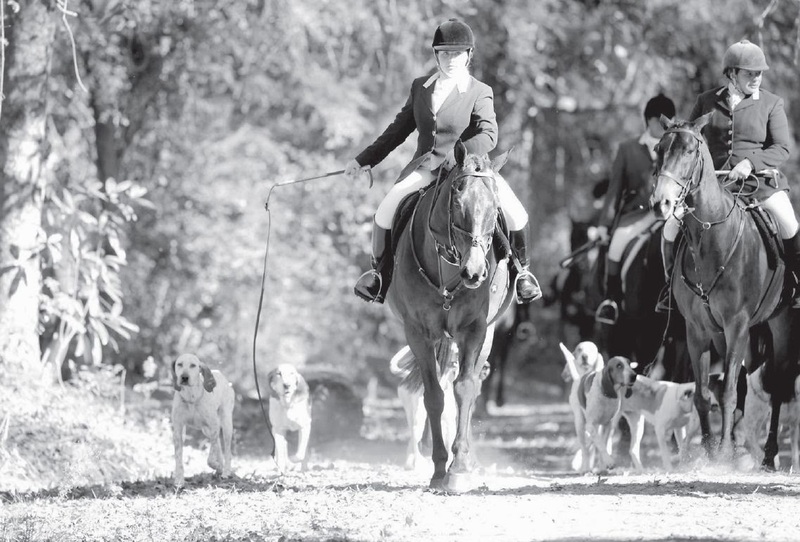 In those years, the Aiken Hounds was the only hunt in the area, and many members of Aiken's Winter Colony participated. These people were not casual or timid riders. In fact, a number of them were amateur steeplechase jockeys, and the hunt served as a training exercise. The Hitchcocks, and all those hoping keep up, were mounted on "clean-bred" thoroughbreds, and they flew. Harry Worcester Smith describes one portion of the hunt this way"
"The Master says, 'Let's go!' And the sport begins! Three abreast they charge the first jump on the Todd Cut and race up the hill at a strong pace, turning right-handed, go down the Jouac line, over three or four jumps and then turn left-handed into the new Border line, and here is where the fun begins! The jumps all average four feet four to five feet six inches, according to the rise and fall of the ground. And going at a racing pace the horses take off two or three feet in front, and land found or five feet beyond, covering fifteen or twenty feet, and how they love it....I must admit the spirit of racing enters these so-called drags quite a little..."
Every hunt was not a race, however. One of the great advantages of a drag is the ability to control the pace as well as the route, and there were always slower hunts that took smaller fences. These were designated as children's hunts. The smallest children might go out on a lead rein, while older and more accomplished riders would jump and learn the duties of the hunt staff. Mrs. Hitchcock was always conscientious about teaching children and bringing up the next generation of sportsmen. That commitment to youth continues today, and the Aiken Hounds regularly holds children's hunts and employs the services of a junior whip. The Aiken Hounds today is led by Linda Knox McLean, the third woman in her family to serve as master of the hunt. Her mother, Lucetta Crisp Knox, was the master from 1956-1966. Her grandmother, Helen Knox, was the master from 1940-1945. Her great aunt, Frances Wood, was the master from 1948-1951. Linda has been the master since 1994, meaning that she has led the hunt for 20 years, the longest tenure in the history of the hunt. Women in he family have been masters of the hunt for 38 of the past 100 years. The Aiken Hounds go out every Tuesday and Saturday during the season, which runs through March. The fields are often quite large, sometimes even as large as they were in Mrs. Hitchcock's day. The jumps are not as tall or as wide as they were in the old times. The pace, although it can be galloping, is not as brisk as when it was set by some of the boldest jockeys in the country. But the scene must be substantially the same. The woods have a timeless quality to them, and the traditions of the hunt live on. If you go out and watch, or join the hunt and ride, you will see the hunters in their green coast, the well-groomed horses, the tri-colored hounds with their noses to the ground, and you will be observing something that could have taken place 50 years ago, or 100. One of Aiken's favorite traditions, the drag hunt is entering its second century on solid footing, and seems likely to continue for many years to come. The hounds catch the scent, give tongue, and they are off. The hunt is on.